Your pet loves to go for a ride, but you don't love what he leaves behind: mud, wet spots, shed hair and dander, snags and other hard-to-fix damages to your car's upholstery. 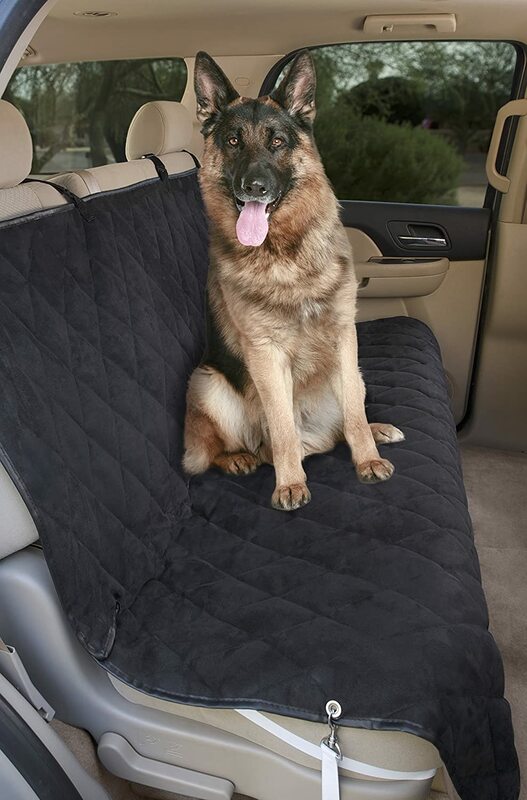 This seat cover will keep both of you happy: plush comfort for him and a back seat that stays good as new for you. Let your pet be as rambunctious as he likes, this cover will stay where you put it without sliding or bunching. Adjustable straps of heavy-duty webbing loop around the headrests while elastic straps slip underneath the bottom corners. Two anchors go into the crevice between the back and bottom cushions, holding the cover snug against the seat. Measuring 56" x 47", the cover adapts to all vehicle makes and models with design features such as headrest loop position adjustment, extra-wide slits for seat belt buckles, and side vents for narrower vehicles. Made of heavy-duty microsuede protected with Stain-Block, this cover can take whatever he dishes out, then go right into the washing machine. It's constructed for durability in every detail with vinyl bound edges and sturdy metal grommets and hardware. Quilted padding adds multiple layers of comfort and protection. Complete with a one-year warranty, it's destined to give you and your pet many hours of happy traveling.